Sea Turtle Conservancy is challenging restaurants to adopt a new policy: only offering straws upon request. The Ocean Conservancy created the successful “Skip the Straw” campaign and is currently working with Chiles Restaurant Group in Anna Maria Island to adopt this policy. STC has expanded the idea by creating a 5 x 7 sign that restaurants can use that explains why there are no straws available, how straws impact wildlife, and where to find more information about marine debris. This sign can be displayed on menus or near self-serve drink stations, where the straws would normally be offered. Giving up straws is a small but incredibly impactful way to help save wildlife. Americans use more than 500 million straws daily, and they cannot be recycled, leading them to sit in landfills or end up in digestive systems of birds and other wildlife. On the coasts, plastics are already negatively affecting more than 660 marine wildlife species. Sea turtles are especially impacted by plastic waste. Like humans, a sea turtle’s mouth cavity is connected to its nasal cavity; as it has occurred before, if accidentally ingested, a straw may become lodged into the turtle’s nose. Not only does this lead to direct complications such as prevention of proper breathing and sense of smell—a turtle’s primary method to locate food—but it can also cause complications with migration and the ability to find a mate. Forgoing straws doesn’t just help wildlife – it helps people, too. Restaurants that choose to adopt this policy will spend less money on ordering straws, because they will not use as many. Customers also enjoy supporting environmentally-conscious businesses, so adopting this policy may encourage more customers to come to a restaurant. Humans depend on the ocean for food, recreation, and economic benefit. If the ocean is filled with plastic, humans will suffer as well as marine wildlife. Restaurants in Gainesville (where STC is based) have already begun to embrace this policy. 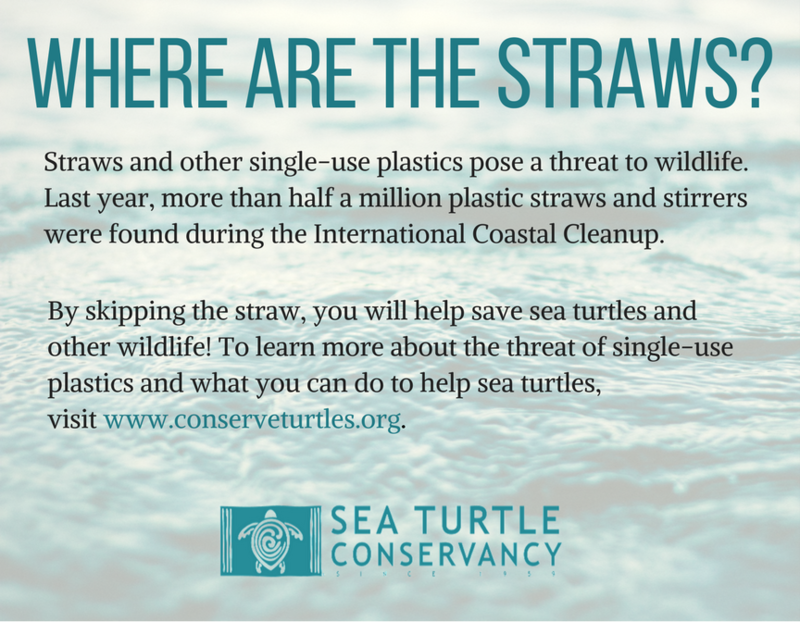 STC believes this campaign will be even more successful at restaurants along A1A, where straws can undeniably end up in critical sea turtle nesting habitat. If a restaurant is interested in adopting this policy, wants a customized sign or wants more information about this initiative, please contact Stacey@ConserveTurtles.org.